The daughter of a wealthy family is kidnapped and imprisoned underground in a coffin, while her family and the police search for her. 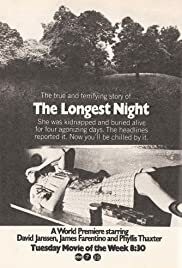 Mercenary couple kidnap a young woman, the daughter of a wealthy businessman, from her hotel room and hold her for ransom--but, while they are waiting for the $500K in cash to arrive, they have buried their victim underground, in a ventilated 'capsule' with enough air for only seven days. Made-for-TV drama, based on a true account--and apparently recreated faithfully--hasn't a single twist or surprise; writer Merwin Gerard blessedly steers clear of histrionics (everyone keeps a cool head), but there isn't much action--what with the girl buried alive in a confined space and her father dealing with her abductor over the telephone. Much of the film's success is due to the performances, and David Janssen (as the distraught father) and James Farentino (flashing his dimples as the kidnapper) are quite good. Director Jack Smight mounts the story in textbook-like fashion--as a news reporter might--scene by scene as dictated by fact. Story revisited in 1990 (also as a TV-movie) entitled "83 Hours 'Til Dawn".